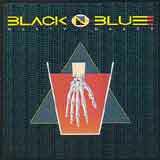 Moving right along through the Black 'n Blue discography, we come to the band's third release, Nasty Nasty. For this and the final release of the band, In Heat, Gene Simmons of Kiss handles production duties. Again, the band manages not to repeat itself and again makes a moderate change to its sound. This time, the band migrates more toward the LA sleaze sound of the 80's that matches the glam-o-rific image of the band. And again, Nasty Nasty is a solid and often overlook album from a widely overlooked band. Nasty Nasty sees the band return the basics of the debut album. The crunchy guitars make a comeback, and the songs in general rock harder than its predecessor. This album is best known for the hit single, I'll Be There For You. This single actually received a respectable amount of radio airplay and a video even made an appearance on MTV (do they still exist?). I'll Be There For You is a catchy, keyboard backed mid-tempo anthem, sounding very much like the Without Love era. However, the rest of the album is much more guitar rock oriented. I can't help but feel like this album was somewhat rushed is spots. Of course, Nasty Nasty is the band's third album in three years, so my feeling could in fact be correct. The guitars aren't quite as energetic as the debut, and the songs don't jump on you nearly as easily as those found on Without Love. Like the previous two albums, I cannot pinpoint a single weak track on this album, they still have a hard edge and are well constructed. On the flip side of the coin, I would hesitate to call any of these tracks (aside from I'll Be There For You) an absolute killer. For me, Nasty Nasty is a collection of very good Black 'n Blue songs, no more, no less. And a good Black 'n Blue album is still a lot better than a lot of the generic glam material being released at the time: Nasty Nasty is a very good rock n rock album. Perhaps, this album is a sign of things to come as the band's final album takes a step backward actually sounds quite flat in spots. Nasty Nasty doesn't quite capture the best elements of Without Love and the debut, yet they still manage to deliver a very respectable album of what rock n roll is all about. Jamie St. James' charismatic vocal delivery and the flamboyant guitar soloing carry the band on this album. I would definitely recommend newcomers to the band start with the first two albums, and then move along to Nasty Nasty which is just a notch behind the first two efforts.